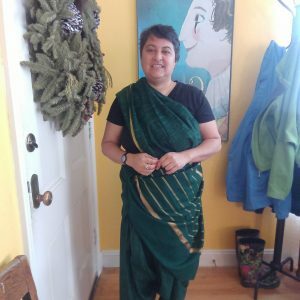 I started this blog YEARS ago, and wrote a lot about how Indian clothing had influence my thinking, but didn’t talk much about actively wearing it. There are a lot of reasons for that, but times have changed, and here we are, in 2018, and I am unironically, uncostuming-ly wearing saris as part of my daily wardrobe. 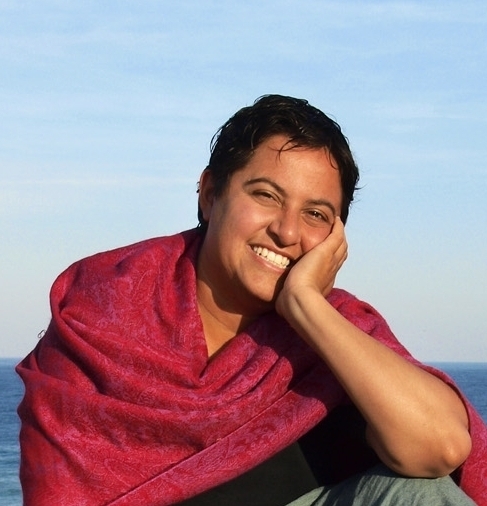 Last year when I went back to India after 17 years, I started wearing saris as…clothes. Part of that was about weight gain–I simply don’t fit into most RTW kurtas anymore. Part of that was that I really wanted to practice, and dadi is OLD–97 then, 98 now, 99 in November. If she’s going to teach me stuff, I have to start engaging the learning process. Part of it was this blog itself and the thinking that went with it. Draped clothing is revolutionary, revolutionizing, decolonizing stuff. It is a radical act to demand that one’s clothing conform to one’s body, but that wasn’t always the case. The ancient people in most places draped their clothes. Sewing was a much later and fussier invention, and in many places it was mostly to keep things on the body more easily and not to do with modesty, until later when modesty became a Thing. But by draping the body in untrammeled fabric, one reclaims the idea that the body sets the rules and the outside forces follow them. My body is what it is; my sari does what I tell it to do according to my body’s needs. It is ALSO radical because it doesn’t have this replacement thing going on. Saris are amazing and gorgeous and I want to collect ALL OF THEM–but I can also wear the ones that my grandmother hands down to me. I don’t replace them when I gain or lose weight (maybe I have new blouses stitched–that’s a yard of fabric at the outside–or maybe I wear them with other tops in my wardrobe.) and I can wear any sari that someone gives me. They are a standard size but they fit almost anyone (exceptionally tall and wide people sometimes have a challenge, but even that is a vestige of conformity–six yards is a lot of fabric if you don’t have to make it do something specific). If there weren’t Right and Wrong ways to drape them, if you allow yourself to improvise, then they can really fit almost anyone. Drape it short, long, with fewer wraps around the body or more of them, as pants (two ways!) or as a skirt, for elegance, for mobility, so many choices. And thanks to the internet and a lot of people trained and untrained, we’re no longer hemorrhaging the knowledge when our elders die. It’s being videoed and documented and written down and a new generation of people is wearing them. And we are not just wearing new ones (although some of the new ones are STUNNING) but also the ones our grandparents (and aunts) are giving us. So draped clothing, while it can be very acquisitive (everything fits!) is actually anti-capitalist and pro-handcraft; there’s no waste in a draped garment, and having now spent a year wearing saris a lot more than I used to, I can say with authority that it’s very versatile. I have saris that I can wear like jeans and saris that I wear as elegant eveningwear. I don’t usually post images here, for whatever reason, but I’ve been Instagramming my saris, as part of a loose community of people who are reclaiming and reviving them. So here are a couple of pictures of today’s sari–a nauwari (nine yard) sari traditional in maharashtra and a few other corners of India but much less common than the six yard version. I’ve draped it as old-school maharashtrian women do, with a lot of pleats in the front that then get pulled through the legs and tucked in the back waist to make a pants-like bifurcated bottom. I’ve skipped going over my head with the pallu, but have brought it around my waist to tuck it in and keep it in place. This drape can be very elegant or super practical–today is definitely in the practical camp! I love wearing saris (this one with a t-shirt, because it’s comfy) when I can wear them my way. The more worried I am about getting it wrong or getting it right the less able I am to treat them as just clothes. It’s clothes! But it’s radical anticapitalist fat friendly mybodybelongstome smash the patriarchy clothes. 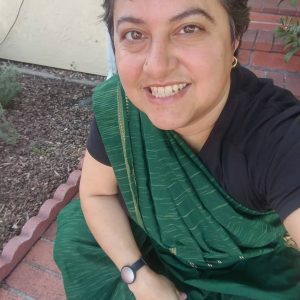 NB: The emotional weight of wearing a sari as a diaspora kid in an explicitly antipatriarchal context like the company I choose to keep is WAY DIFFERENT from wearing one if it’s the thing you’re wearing because your mother in law really prefers that you wear one now that you’re a married woman you should dress like one and please no jeans. The combination of increasing liberation for women in India and massive amounts of privilege is what makes this revival of saris easier. If you can CHOOSE to wear them, they’re fabulous. If they’re the only thing your husband and inlaws or community allow you to wear, that feels very different. I do not have the weight of that experience or context sitting on my head when I put one of these on. To me they are a hug from my grandmother, a release from clothes that don’t often fit right, a way of reclaiming my heritage. To me all the old drapes that are getting documented and reclaimed are fantastic and innovative and liberationary (is that a word?) because they make it practical to wear saris in a way that the “normal” (nivi) drape does not. The nivi drape and its attendant rules, when done “properly”, leaves you wearing a floor length gown. Elegant, but damn near useless if you have to be active. Women who wear it routinely modify it through their day–tuck it shorter in private spaces and wrap and tuck the loose end at the waist if they’re cooking or tending children, etc. Many many other drapes are designed to be more practical. HOWEVER many people of my grandmother’s generation had to adopt the nivi drape in order to become socially mobile. Old style drapes labeled you as “country” or poor or lower class. I have the privilege of reaching into the bins in the back of the closet for things that are deserving of visibility and respect and presence that my people could not. All this context matters, as does the revival itself. And the right of South Asian and diaspora people to decide how much of this they want, and how much they don’t.